Made in China around 1900, this small yet striking ornament depicts a delicate butterfly alighting on the plush petals of a blossoming flower. With its profusion of iridescent kingfisher feathers, which have been deftly cut and inlaid into delineated segments of silver sheet, the ornament’s materiality firmly grounds it within the tradition of tian-tsui — a millennia-old Chinese art form in which kingfisher feathers are used as a decorative inlay. For 2,500 years, Chinese artisans used these dazzling plumes to embellish luxury goods ranging from items of personal adornment, such as hair ornaments, headdresses, and fans, to objects, such as decorative panels, wall hangings, and folding screens. 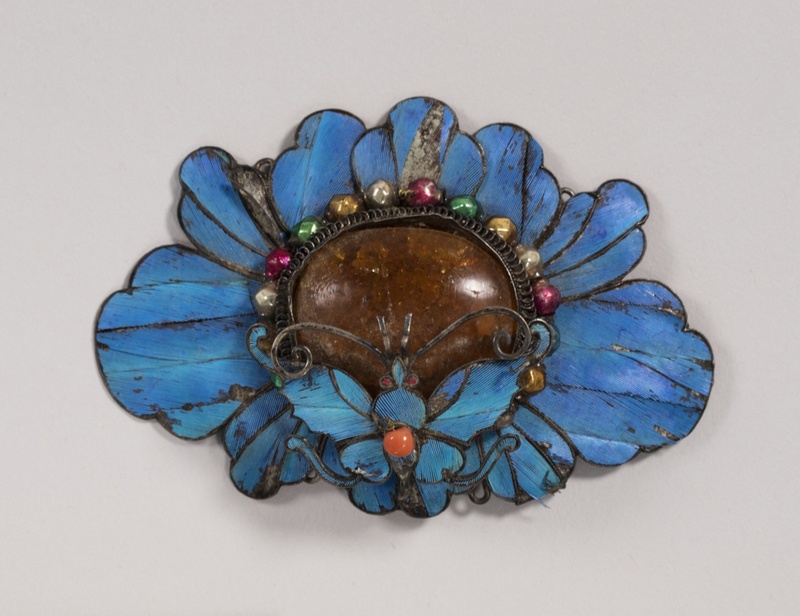 Four closed hooks soldered onto the back of this ornament suggest it was likely attached to a larger accessory, such as a headdress. Throughout their long and varied history in Chinese material culture, kingfisher feathers have always been considered a mark of opulence worn to display one’s wealth and status. This was due in large part to the difficulty in making such resplendent objects. First, a silversmith would cut the ornament’s base shape from a thin sheet of hammered silver or silver-gilt. Additional design elements would have been cut and soldered onto this base to create a three-dimensional form. Gallery wires were then soldered along the edges to further define each shape, as well as transform the base into a backing of delineated cells where the feathers could be applied. A craftsman would then cut kingfisher feathers to the desired size using a blunted tool. The cut pieces would be run through an adhesive called funori, derived from a mixture of animal hide glue or isinglass (made from the swim bladders of fish) and seaweed extract, and smoothed onto the surface of the ornament using a brush. This painstaking process required patience, dexterity, and above all a meticulous eye, and surely contributed to the high cost of these luxury items. Drawing on the millennia-old cultural narrative associated with tian-tsui, one tied to empresses and leading members of Chinese society, this ornament illustrates the desire to emulate these elite women in the hopes of elevating the perception of one’s own rank. This idea can be further supported given the ornament’s date, which coincides with the period in which this exclusive trend trickled down to China’s middle class. Such “emulative consumption” underscores the power of the kingfisher’s symbolism and the profound impact its feathers had on Chinese material culture. While there are few craftsmen today who know this ancient art form, this ornament presents an example to be treasured. Morgan Albahary is a graduate student in the History of Design and Curatorial Studies program offered jointly by Parsons School of Design and Cooper Hewitt, Smithsonian Design Museum. Thank you so very much for providing the information on how these pieces were constructed! I had always been curious about the process, and now, due to your explanations, can grasp the essentials.